Project Spotlight: Creating a "Category 5"
Platinum Platypus turns to LightWave to create over 100 visual effects shots for the STARZ Original Movie "Category 5"
NORTHPORT, N.Y.: When cameras rolled for the STARZ Original storm disaster movie Category 5, it was a lovely summer day in Gulfport, MS. While beautiful weather is usually a plus for location shooting, it wasn’t advantageous for Category 5, which—as the name implies—involves catastrophic winds, rains and other destructive forces of nature. By the time the movie was finished, the sunny blue skies and puffy white clouds had all been replaced by dark, menacing clouds, torrential rains and trees wildly swaying in powerful winds. A heavy wooden beam fell from the ceiling onto a boy, a van swerved to avoid hitting a downed telephone pole, and a man was knocked down when a tree branch smashed through the window as storm gusts overturned and destroyed the furniture. These are some of the more than 100 visual effects shots that Platinum Platypus (Plat/Plat) created for the STARZ Original Category 5, a 90-minute film directed by Rob King and produced by AltaVista Entertainment in association with Blacklion Entertainment. “The biggest challenge we faced on this project was making beautiful, hot summer days look ominous and stormy within a very tight timeframe and budget. These visual effects had to be credible because they were crucial to conveying the severity of the storm and the premise of the plot,” said Pete Sussi, president of Platinum Platypus, in Northport, Long Island. In addition to a growing number of visual effects movie projects, Plat/Plat also does visual effects, character animation and motion graphics for broadcast design and commercials. For this movie, Plat/Plat ramped up from three to nine visual effects artists to handle the movie’s intensive CG workload demands. Sussi, who served as the movie’s visual effects supervisor, was on location whenever visual effects scenes were shot. When the 1080/60p HD production (shot with Arri Alexis digital cinema cameras) was complete, he brought most of the over 100 hi-res back-plate files to his NY studio on G-RAID drives. A few pick-up shots subsequently arrived via FTP. But he’s quick to point out that it couldn’t have been done within the Category 5 budget and timeframe without the help of several unique tools in LightWave 11.5 or later builds, including Instancing and Flocking. Using online images of birds as references, Sussi’s visual effects team used LightWave’s 3D modeler to model a few CG birds, surfaced with appropriate coloring and textures. They then animated the birds to flap their wings a few times, coast for a few seconds, and then start flapping their wings a few more times. Using LightWave’s Instancing, they essentially cloned this handful of birds into a flock of about 6,000 birds and offset them to vary their behaviors slightly. 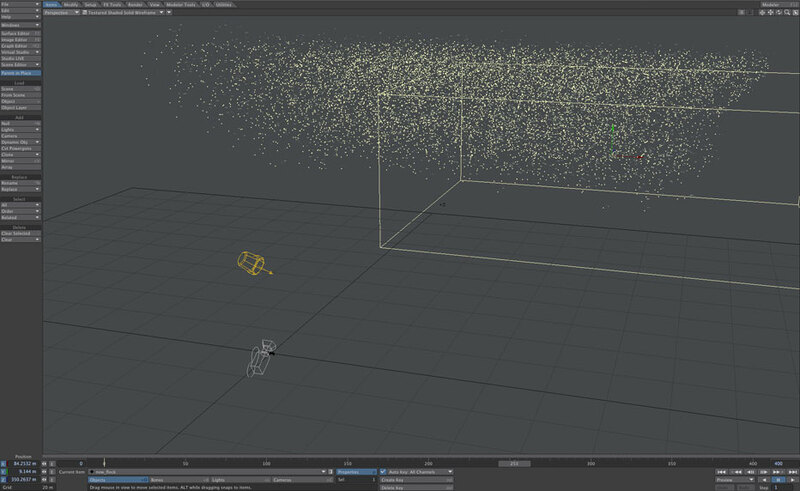 Then using LightWave’s Flocking tool, they choreographed a flight path for them to fly into the frame and then swarm back and forth practically filling the skies. In several scenes where the main characters are driving a white van along stormy roadways in the midst of the hurricane, they swerved to avoid obstructions in the road. In one instance, a metal garbage can with a lid comes flying out in front of their vehicle and it’s tossed and turned by the wind until it flies off to the other side. And in another instance a telephone pole is hit by lightning and cracks near its base causing the upper two-thirds of the pole to fall over blocking the roadway just as the van approaches. 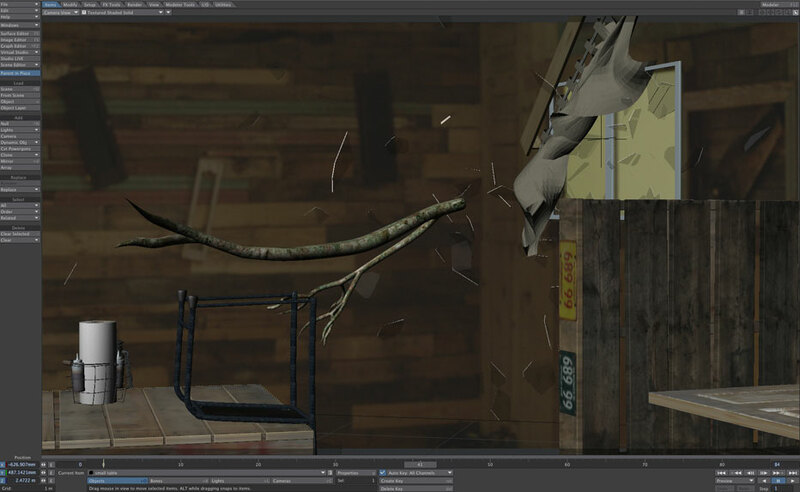 LightWave’s Fracture tool caused the pole to crack and break, and then LightWave’s Bullet feature caused the large broken wooden pole to fall over with its power lines. This 3D telephone pole effect was composited into the back-plate making it appear that the white van hit it, flipped over and slid a short distance on its side. In practical photography, a small ramp was placed in the middle of the road (where the CG pole would fall) and when the driver’s side wheels rode over that ramp, it caused the van to flip onto its side and slide as far as the guide wires would allow. Wire removal was a big part of the post process. In another scene where a heavy wooden beam falls from the ceiling onto a boy, wires were used to suspend it just over the boy, making it look like it had pinned him to the ground. Those wires were also removed in post. 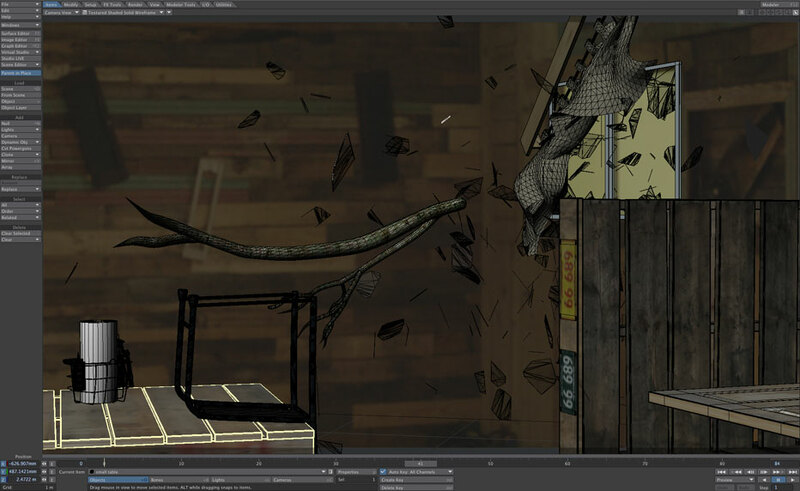 Both the garbage can and the telephone pole were created using LightWave, and those 3D objects were composited into the live plates using After Effects. 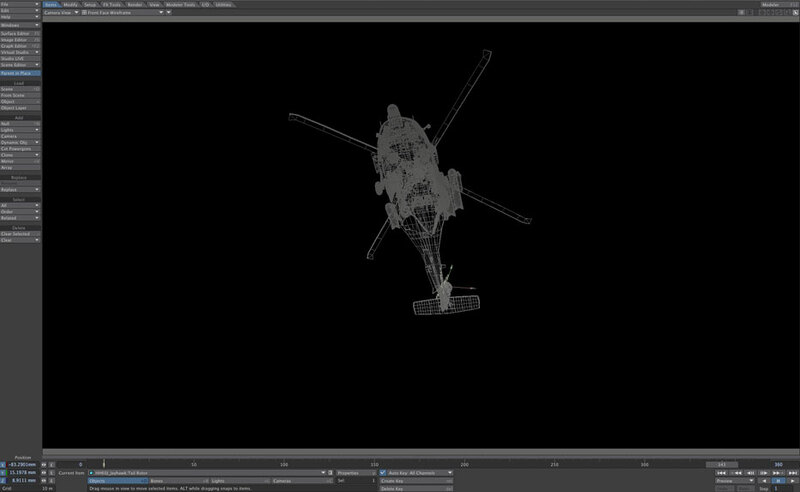 Plat/Plat used the After Effects’ built in 3D tracker, and occasionally supplemented it with a 3D camera tracker from The Foundery. 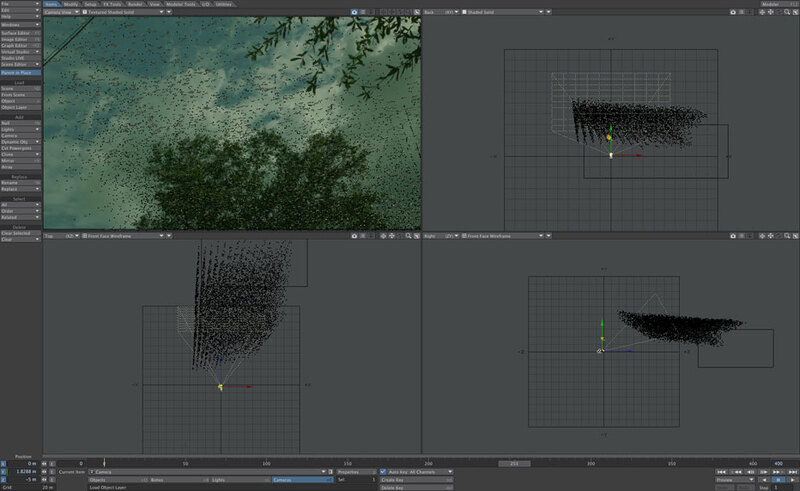 Both software products offer a seamless (plug-in) interface for exchanging CG elements with LightWave. 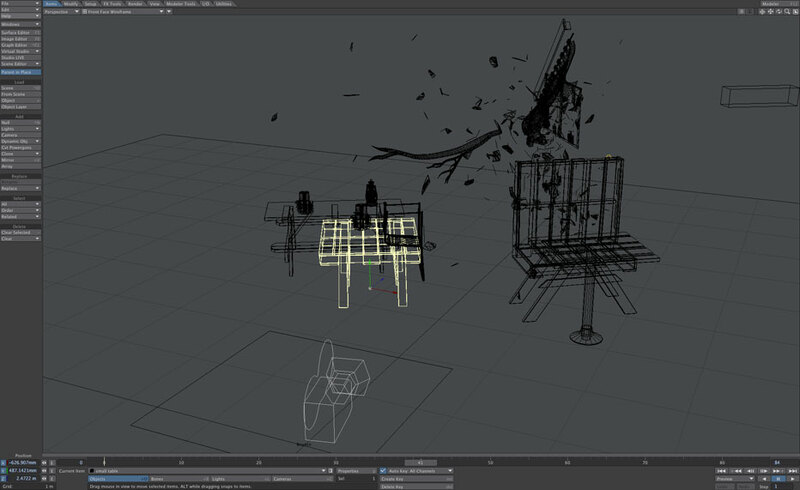 After Effects’ tracker was instrumental in compositing a line of CG trees, 3D modeled in LightWave (along with VUE 3D environmental software) to appear to be violently swaying in the wind. Sussi said, “We created the line of swaying trees that we could use as looping sections. 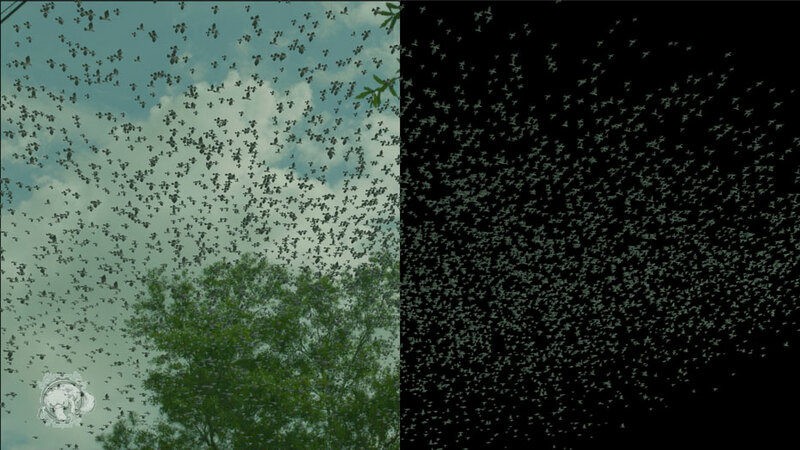 We rendered those out in 3D along with their alpha channel so they could be positioned almost like cards one after the other to populate the roadsides.” After Effects was also used to transform the back-plate’s sunny blue skies into ominous, gray, stormy skies throughout the movie as well as creating particle effects like rain. One of the principal locations for much of the drama in Category 5 is a roadside rib shack, which is a small fast food-style restaurant. In one scene, the storm reaches a fever pitch outside and is now causing destruction to the building. While the restaurant owner is shouting for everyone to take cover in the kitchen, the category-5 winds cause a giant tree branch to come crashing through the window, breaking the glass and causing part of the ceiling to fall in. As the hurricane winds blow in, tables and chairs slide and flip over, knocking the owner to the ground. It all happens in an instant. 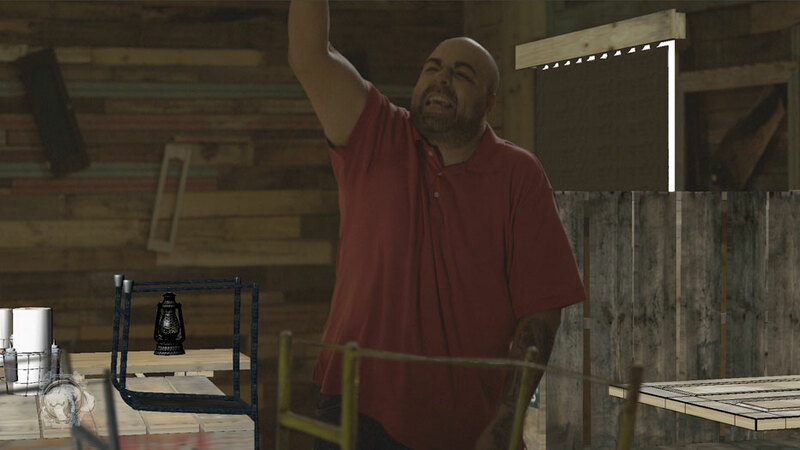 For safety reasons, a decision was made to use a visual effects composite instead of shooting it. The first step was to shoot a clean back plate of the restaurant with all the furniture moved out of the shot. 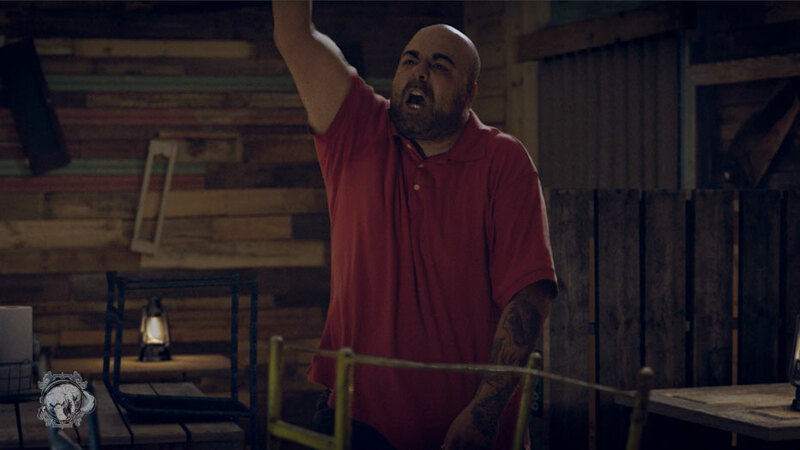 Next, the actor was shot in front of a green-screen while a stagehand shoves him very hard so that he appears to fall down with some force. Next, Sussi and his crew took photographs, and measured the tables, chairs, and all the items that were on the tables such as napkin holders and barbeque sauce jars. They modeled exact replicas of these props in the CG environment complete with the same textures and surfaces. To create the chaotic effect, the clean back-plate was composited into the green-screen, the giant 3D branch comes thrusting into the CG window causing destruction to the ceiling and interior. As the CG furniture slides and flips over, (the stage hand is removed) and the green screen actor appears to have been knocked to the ground by the destruction. Sussi and his crew paid meticulous attention to every detail so that the CG objects would match the real props in any practical shots done at that location. This included accurately replicating the quality and ambience of the lighting for greater credibility. To do this, Sussi said they used a light probe to create a relationship between the CG objects and the way their physical counterparts were lit in the real world. He says that before he found LightWave’s advanced lighting, radiosity and rendering capabilities, it was very difficult to approximate lighting looks without a lot of time-consuming cheats and workarounds. “Now it’s so quick and easy, it’s become pretty mundane and the results look gorgeous,” he said. Considering today’s movie effects budgets, time is definitely money. Sussi said, “You can’t be on a learning curve. 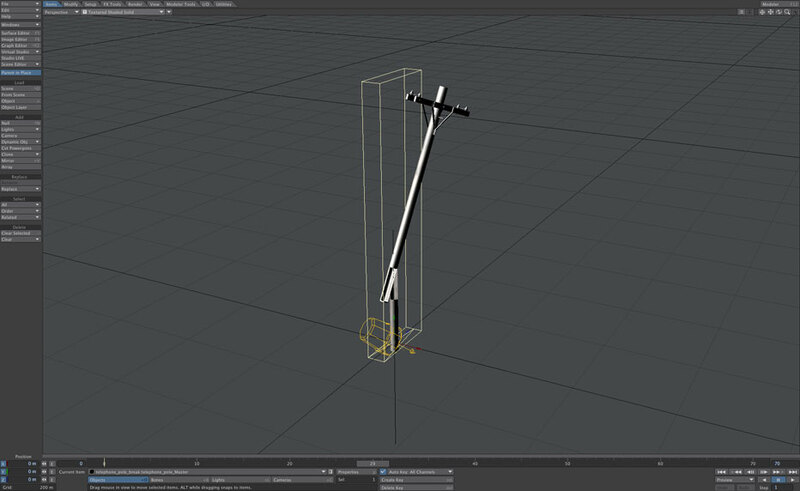 You need to know the ins and outs of your 3D animation software. And the 3D program has to have all the tools you need readily available.” But he adds that whether the budget is large or small, it means the world to that client.